Nitroglycerin (glyceryl trinitrate; GTN), is the most prominent representative of the organic nitrates or nitrovasodilators, a class of compounds that have been used clinically since the late 19th century for the treatment of coronary artery disease (angina pectoris), congestive heart failure and myocardial infarction. The beneficial clinical effect of GTN is due to dilation of large coronary arteries, resulting in improved blood supply to the heart and venodilation, resulting in increased venous pooling and consequent reduction of venous return and cardiac preload. The combination of increased supply and decreased demand of oxygen provides unique therapeutic benefit in cardiac ischemia. It is well established that GTN is a prodrug that is bioactivated to yield nitric oxide (NO) or a related species which activates soluble guanylate cyclase in vascular smooth muscle, resulting in cGMP-mediated vasodilation. 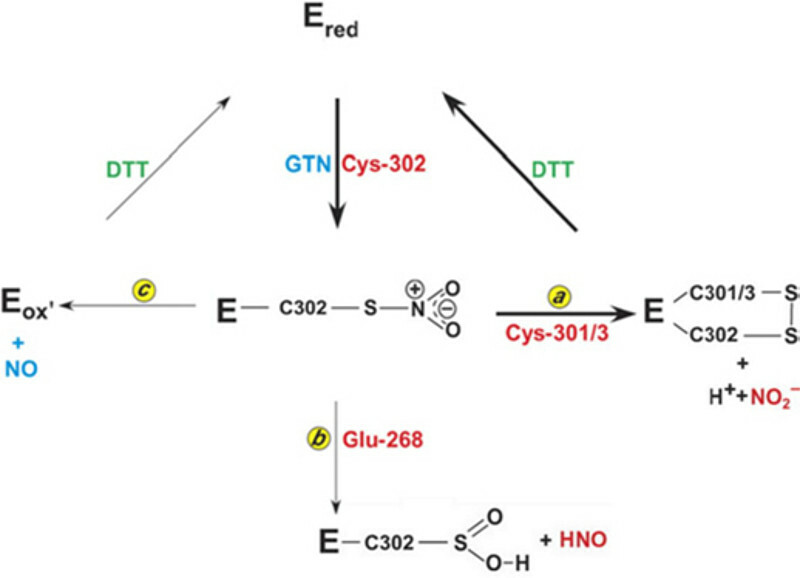 Several enzymatic patways may contribute to GTN bioactivation, but aldehyde dehydrogenase-2 (ALDH2) appears to be the key enzyme mediating the therapeutic effect of GTN. We focus on the characterization of the ALDH2-catalyzed reaction, with special emphasis being placed on the poorly understood direct reduction of the organic nitrate to NO and the mechanisms invovled in mechanism-based ALH2 inactivation that may contribute to the development of nitrate tolerance. A, GTN (yellow) is shown in a ball and stick representation. 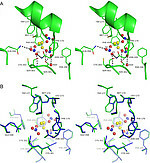 Active site residues are shown as sticks. 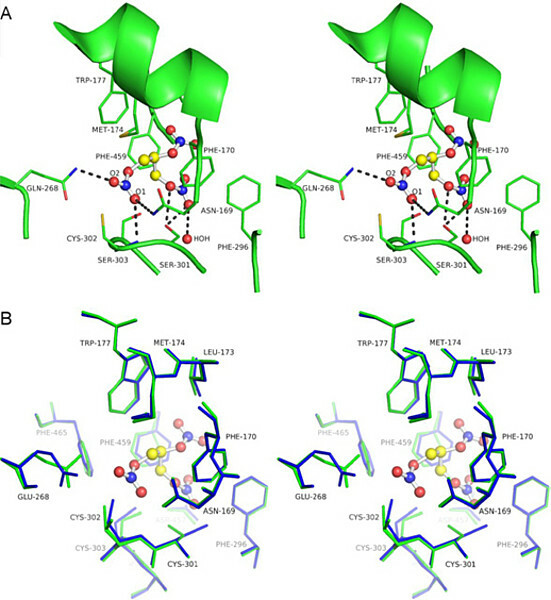 The resting conformation of Cys-302 has been omitted for clarity. Dashed lines indicate polar interactions. 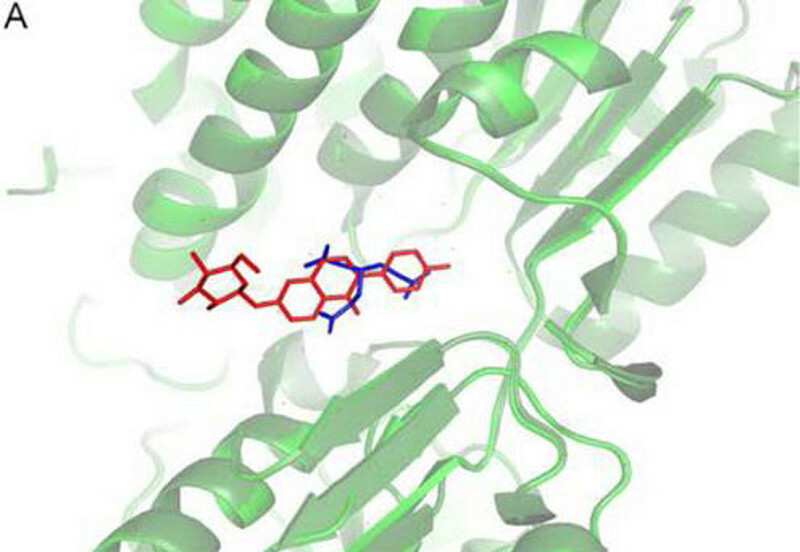 A, schematic representation of the GTN complexed triple mutant (light green) superimposed onto the daidzin bound wild-type enzyme (dark green) (PDB 2vle). GTN and daidzin are shown as sticks in blue and red, respectively.